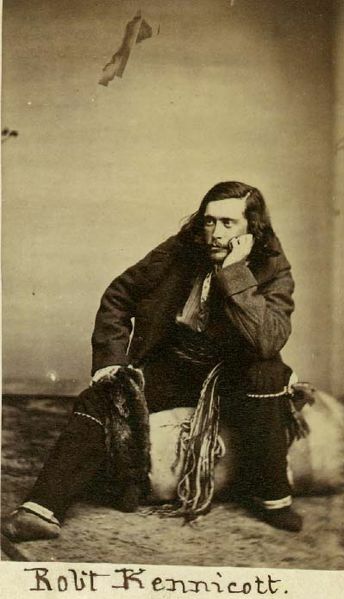 taken with the clothes he was wearing on his expedition. 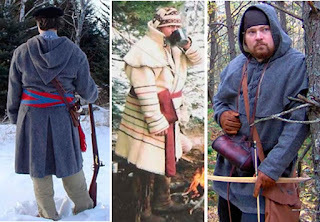 with an Assomption sash (metis sash) and a marten fur skin fire-bag. His pants are trimmed with ribbon on the outside seams and on the cuffs. Canadians and French Canadian Metis of the North West. 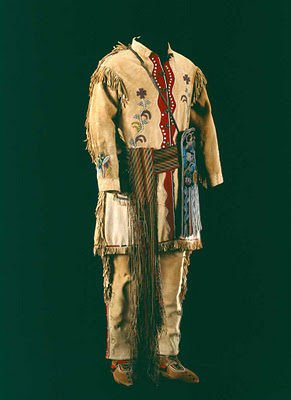 The colors of the capote may have been light blue or grey with white buttons. and the pants a dark blue with a yellow accent. The garters may have been red and yellow and made of silk. 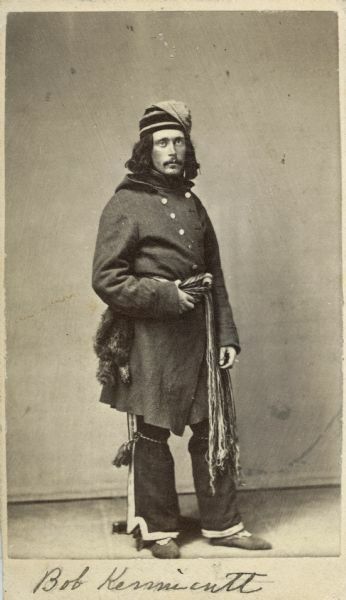 Father Emile Petitot met Kennicott at Portage La Loche in 1862.
factor of Fort Simpson who had accompanied Kennicott to the Portage. head a florentine toque of green velvet ringed with silk embroidery. of Fort Edmonton M. Christie accompanied him." petulant, who talked through his nose by the name of Kennicott. livelihood. We might say that he looked like a clown of the new "Cirque". be a unique breed." ...from "The History of La Loche"
Kennicott describes his fire-bag on January 18, 1862.
is made of a fine, large marten skin, and is the bonniest one in the district." Note: The use of a prime fur as clothing or accessory is unusual. Trade furs were too valuable to wear. 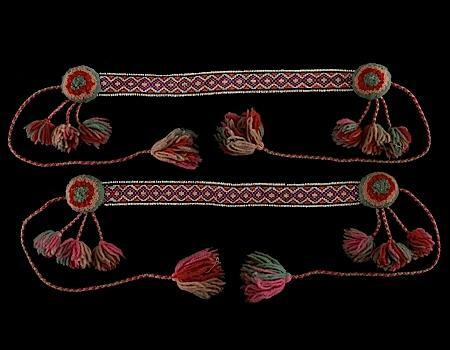 Two ways to tie a sash: military style and metis style. 1. "First I have to say that military sashes are different than civilian or metis sashes. I found this on-line somewhere regarding tying military sashes. It works good on that type but not so well on the metis style. Wrap the sash around the body (keeping it snug). The length of a sash usually allows it to make 2 1/2 wraps. When the wrapping end is about the desired length of hang, pull the end up from the bottom underneath and over the already wrapped sash kind of like cinching up a horse saddle. Then pull the hanging fringe from the middle of the front around to the overlap and give it a tug. It should give a very snug hold without the knot and it lies flat. When your finished, both hanging ends of the sash should be about even (this is were it takes a bit of trial and error in finding your starting point). By adjusting how much is left hanging in the front when you start you can even up the ends. The sash can then be slid around the body to position the hanging ends wherever you want. As for my metis sash I've taken to using a four-in-hand knot which can be tied in the front and moved to the side or back and has the advantage of being adjustable so it can be tightened if necessary. I've also seen people use a square knot." 2. "There is some way to tie a sash in a flat knot, but I can never remember it. Instead, I just tie mine in front into a square knot. 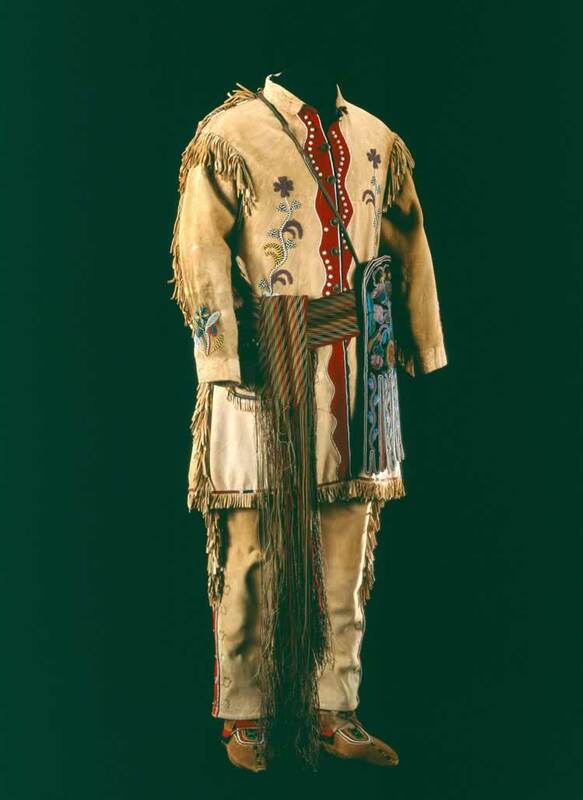 If you study paintings of guys wearing sashes (Rindisbacher and Kreighoff are good), and take a look at photos of Métis from the mid to late 1800s, you'll see them knotted in front, behind, and on either side. No rhyme or reason to it, just personal preference. And most look to be plain knots. Those guys wore the sash all day, every day ---it was their belt. Study those old paintings and photos, then tie it how and where it's comfortable for you." 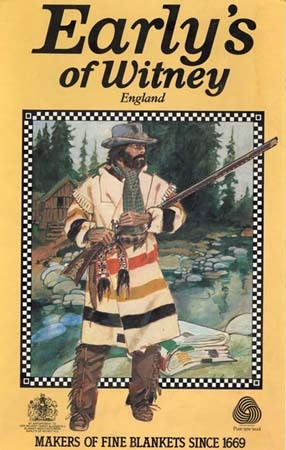 John Lefroy, holding a rawhide gun case with red accents, is wearing a white capote with a dark hood with trim. A decorated bag hangs from his assomption sash. 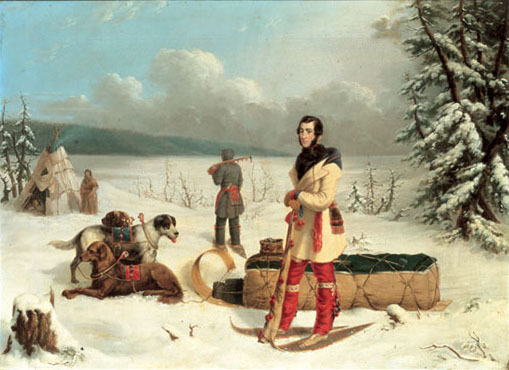 He is wearing a pair of mitts on a string with red and green cuffs, a pair of red leggings (over trousers), with garters just below the knee and moccasins with snowshoes. 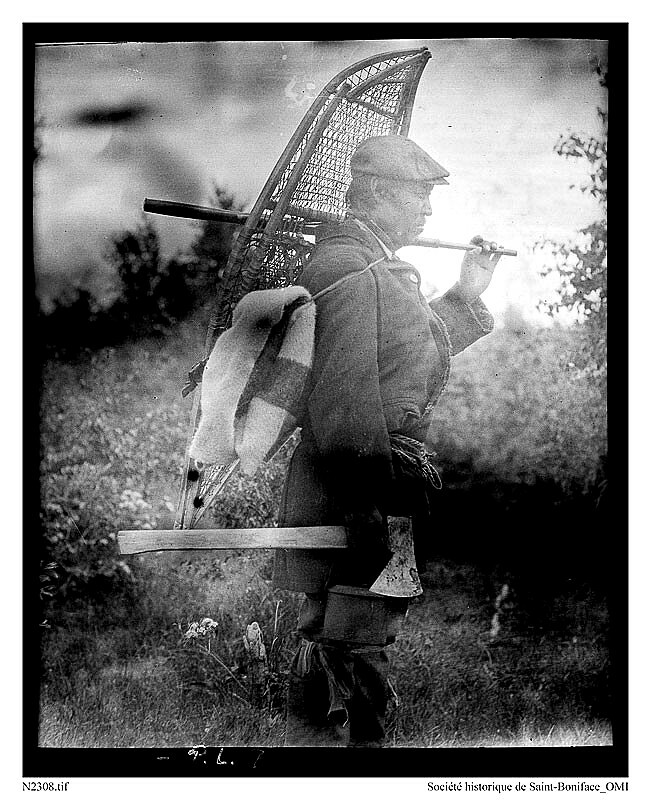 His companion, also on snowshoes, is wearing the same type of clothing and carrying a rifle in a bag. The two dogs harnessed to the toboggan are wearing bells on their backs and on their collars. Each has a small blanket on their back one red and one green. a cap. He is possibly heading north of the Clearwater River to a cabin on his trap line for the winter. Knee garters or leg ties may simply have held the pant legs up so the cuffs would not drag on wet, icy, snowy or muddy ground below the moccasins. The leg ties on the Boniface Janvier photo above appear to be strips of cloth tied with a knot. 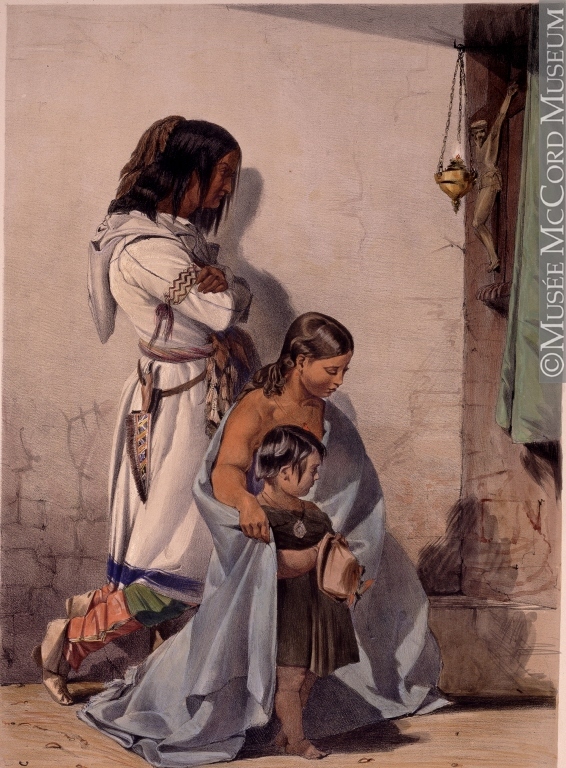 This was painted by Peter Rindisbacher in the 1820's in the Red River area. It shows a man with a whip dressed in a blue capote elaborated decorated with multicoloured ribbons, an assomption sash, red leggings (and or trousers) with ornamented cuffs, garters below the knees, mitts joined by a red string and a type of head covering (either a cap or a toque). The man with a rifle in a case breaking trail in snowshoes is wearing a decorated hide buffalo robe with fur on the inside, a pair of blue pants with red cuffs, moccasins and a red hood with a feather. 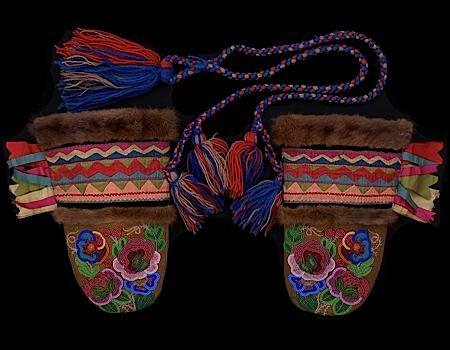 The three dogs pulling the sleigh are covered in small beaded red blankets with yellow accents. They have sets of bells around their necks and additional bells sticking out above their collars in a colourful display.